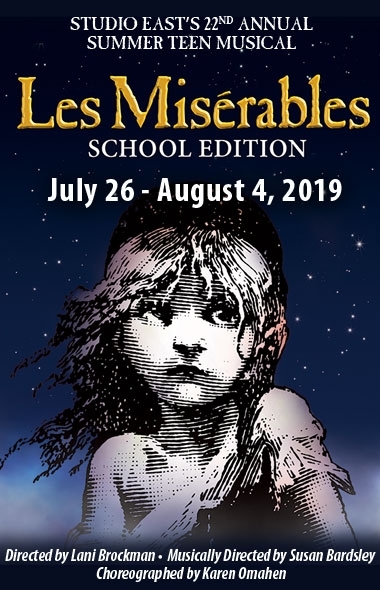 Studio East’s 22nd annual teen summer musical presents Les Misérables. This epic story recounts the struggle against adversity in 19th century France. Imprisoned for stealing a loaf of bread, petty thief Jean Valjean is released from his 19-year term and not only becomes an honest man, but the mayor of a prosperous town and a loving adoptive father – violating his parole in the process. The relentless Inspector Javert, who makes a decent life for Valjean impossible, consequently pursues him. Only years later, after Valjean proves his mettle during a bloody student uprising and saves the life of a young man hopelessly in love with Valjean’s adopted daughter, does the ex-convict finally feel fully redeemed.